Properties of Gases and Moist Air with Temperature. Please use the 5 step process for selection. 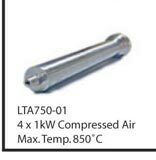 First, choose on the maximum rated exit temperature of the Airtorch. If below 900°C , please choose TA models e.g. VTA and MTA models. If above 925°C please choosethe MVTA or DPF models. The Airtorch convective system uses a special class of elements to heat ambient air and direct that heated air towards a surface or into a chamber. 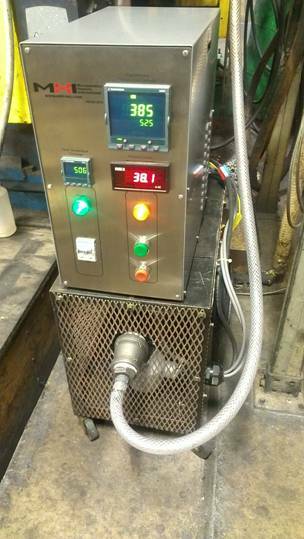 Depending on the model, the Airtorch™ system can achieve temperatures ranging from room temperature to 1100-1200°C (~2200°F) with infinitely variable volume flow rates and no harmful emissions, providing a beneficial new method of heating with modern controls. MHI Airtorch™ applications are in drying electrical varnish, weld pre-heating, die heating, plastic softening prior to forming, drying motor parts, removing moisture, expansion fitting, combustion,, simulation preheating and heating molds, curing, prosthetics, heat shrinking, compression molding, flock setting, curing catalysts drying slurries, freeze drying, improving ink print finish, finishing mirror drying, latex, heating adhesives, and general heating of chambers as shown below. Add to chambers for powder, liquid finishing. Add to continuous furnaces for wood conditioning, metal finishing and forming. 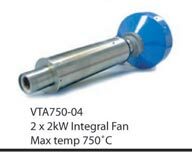 Very smalll but finite temperature drop is experienced when directing Airtorch™ flow with insulated piping because of the high velocity. 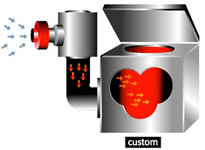 processing, chemcial processing or direct die heating. 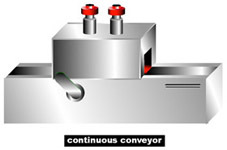 a variety of applications inlcuding in-line with pressure. Call MHI for more information. Sealed models like the MTA and MVTA are available. 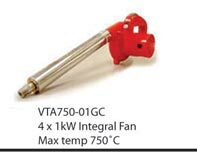 With its variable volume flow rate and power adjustability, the Airtorch™ can be set up to perform at any condition of flow-temperature under the curve. 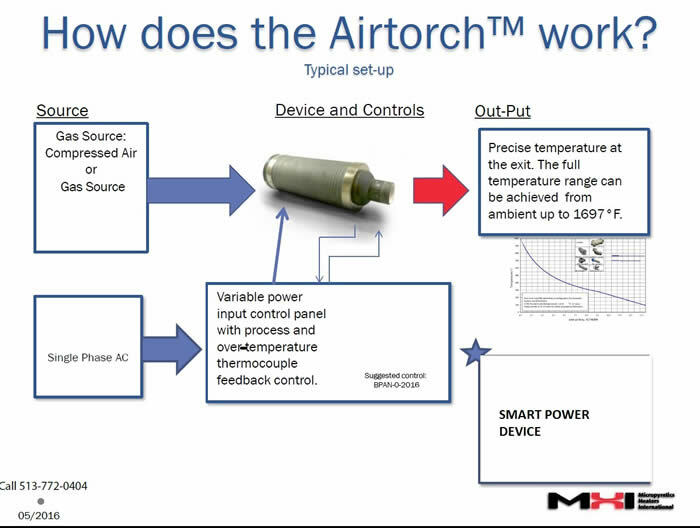 Such features offer the user maximum flexibility when applying the Airtorch™ technology to your specific heating application. Easy to use selection and design page. 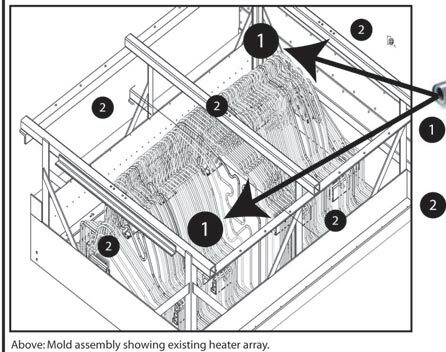 Example of Use to Augemt an Existing Furnace Installations for Improved Power and Iniformity. Example of a 4kW Airtorch™ augmentaion application schematically shown below. In this application, many complex shaped rods are to be heated uniformly. The heat-treater reported that the rods were not uniformly heated in his existing radiant heat furnace. MHI proposed a add-on to his existing furnace with a system of airtorches which then greatly impacted the uniformity and reduced the total energy consumed. More Green Installation and more Profits to the user. Impove oven performances and eliminate bad emissions. 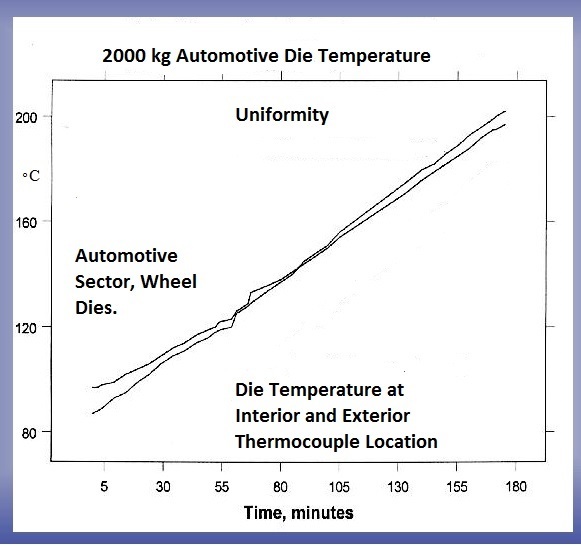 A uniform surface heating retrofit example and continuous oven example is illustrated below. 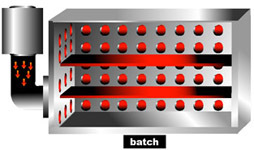 As a rule of thumb an Aitroch power of 0.3 the furnace power is employed when designing for better uniformity. What makes MHI unique for you? - Please Contact for More Information - Useful links for Obtaining Energy Grants. Contact MHI to design the best solution for your application. 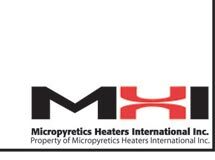 All Trademarks and Trade symbols on this website unless otherwise identified belong to Micropyretics Heaters International Inc.
Industries we serve: Abatement, Aluminum, Automotive, Biochemical, Chemical, Continuous, Ceramics, Casting, EDM, Electrical, Electrochemical, Energy, Food Processing, Foundry, Gold Casting, Fiber, Communicatial, Powdered Metallurgy, Transport, Pls, Power, Semiconductor, Sensors & Instrumentelding, etc.